Day 21 of WDW-40, the latest of my Disney Trip Reports, is here! Today we checked out of one Disney Resort, and checked into a different Disney Resort. We also had Afternoon Tea at the Grand Floridian, and dinner at Jiko at Animal Kingdom Lodge. Today we said goodbye to our room at Disney’s Polynesian Village Resort as our two week stay here had come to an end. We were moving on to our third Disney Resort – Animal Kingdom Villas – Kidani Village for a week. We moved one more time at the very end of our holiday, but more on that then. When you switch between Disney Resorts you have the option for Disney to move your luggage for you, or you can do it yourself. Since we had some time between checking out at Poly and our Afternoon Tea at Grand Floridian, we decided to just do it ourselves. Plus we wanted to have a chat with a Cast Member at Reception. As I mentioned, we had one more Resort change during this trip – just one night at Disney’s Saratoga Springs Resort & Spa. This was because I tacked on an extra day of our holiday quite last minute so that we could be at Walt Disney World for the 45th anniversary on 1st October 2016. I had tried to get the extra night at Animal Kingdom Villas, but they were all booked out. My friend who is also a Disney Vacation Member, suggested we ask when we checked in, as people do back out of their bookings. We asked, but sadly, still all booked. It wasn’t too big a deal in the grand scheme of things, but it would have been handy to save us the move. My Resort Tour of Kidani Village is going to be so tiny, compared with that of my Disney’s Polynesian Village Resort Tour, simply because we didn’t spend much time at the Resort. I think because my brother and his [now] wife would be going home in a few days, we wanted to cram in as much as we could. We didn’t even get a chance to go in the pool! There will be another time, I’m sure. Disney’s Animal Kingdom Villas – Kidani Village is the Disney Vacation Club part of Disney’s Animal Kingdom Lodge. It opened in 2009 after the original DVC area in Jambo House (on the 5th and 6th floor) grew in popularity. Guests (DVC and regular) are able to use all the amenities – pools, restaurants etc., at both Jambo House and Kidani Village. I am going to focus on Kidani Village since that is where we stayed. However, I will just mention about the savannas that surround the buildings of Animal Kingdom Lodge. It is these that really make this Disney Resort stand out from the rest. Across both Kidani and Jambo are four savannas – Sunset Savanna (which bother Kidani and Jambo share views of); Uzima Savanna (for Jambo House) and Pembe Savanna (for Kidani Village). When booking, you can request a standard view (which is usually of the pool or parking area) or a savanna view. I had wanted to be able to see giraffes from our room, so requested a Sunset Savanna view, however we got a Pembe Savanna view. And while I was a bit crestfallen at that, it doesn’t really matter as there are viewing areas around the whole Resort anyway. That said, I have read that you can only see okapi on the Pembe Savanna, so that makes up for the lack of giraffes! There was a Wildlife Spotting Guide in our room so that we could check off the animals that we did see – there over 30 different species to see across the four savannas! Compared with the lobby at Jambo House, Kidani Village’s lobby is small, and a lot smaller than I remembered from our only other visit here in 2014, when we dined at Sanaa. 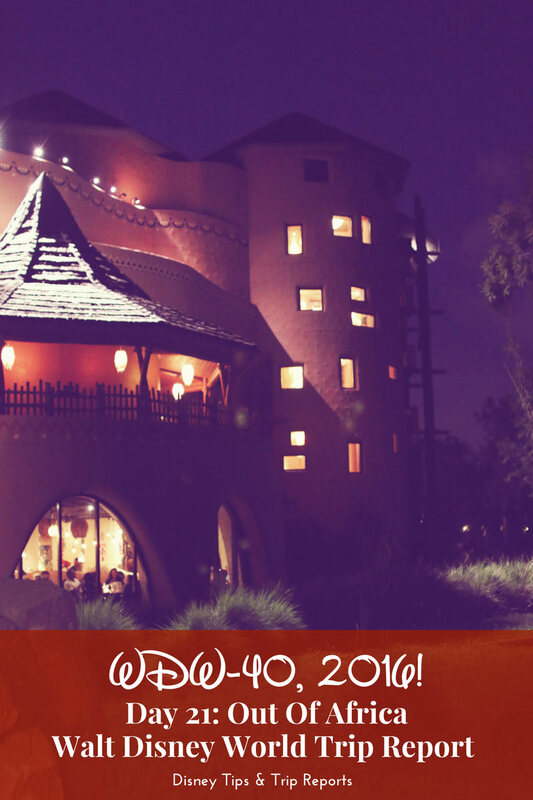 I would also say it is intimate – Kidani Village is a lot quieter, and less busy-feeling than Jambo House. Kidani Village is inspired by the traditional African kraal, the horseshoe-curved design. This gives the building really, really long corridors – and we had a room quite possibly the furthest away from the lobby you could get! Here is our Resort map below – Kidani Village is on the left. The lobby is in the middle of the two horseshoe buildings, and where the Cast Member put a star next to the circle is where we were… I had requested a room close to the lobby as I knew it was a huge distance between the two, but I guess no rooms were available. I’d estimate a good 5 – 10 minute walk back to the lobby if you are located at the far end like we were. We didn’t actually time it, but I know it felt like for-ev-er! And being that the laundry room and everything else was back here it does make me wonder why Disney don’t have something else either midway along, or at the other end. There are some vending, and ice machines en route so you don’t have to go far for that. Bear this in mind when you’re back home from a long day at a park – especially with children, and tired little legs – and more so if you are using Disney Transportation. If you are driving, you should be able to park near to the elevator closes to your room, making the walk a bit shorter. Parking at Kidani Village is underground, which is awesome in the Floridian heat as you get into a nice cool car when you leave. We parked near the Pumba elevator as that would be the closest to our room. We stayed in Room 7865, which, as I mentioned overlooked Pembe Savanna. In the distance we could also see the tip of Expedition Everest over at Disney’s Animal Kingdom Theme Park. At night, we could also see fireworks from Disney’s Hollywood Studios – all very awesome! The rooms have a lovely African feel to them, without feeling to garish or gaudy. White linens on the bed with tribal print accents on cushions and throws, plus the net backdrop behind the headboard. There is artwork on the walls, and the wood of the furniture is a lovely dark colour. The sofa folds out into a bed too. I slept on that a couple of times, as I found myself tossing and turning a lot on the bed and disturbing poor Steve’s sleep. For some reason there is only one bedside table/unit – this seems to be standard at most Disney Resorts (that we have stayed in at least, except for Poly where there was actually one each!) and this really bugs me! We both wear glasses, and both tend to have a bottle of water next to have a drink during the night, so one of us has to fashion a bedside table with a chair usually. A good amount of wardrobe and drawer space is available – but if you have a lot of clothes that need hanging up I recommend bringing some cheap hangers to use as there is never enough! The bathroom has got a small tub with shower, a sink/vanity unit with a huge mirror, and the toilet is behind the door shown below. Additionally, there is a small kitchen area – I don’t seem to have a photo of it, but the set up is much like we had at Poly with a fridge, microwave and sink. Animal Kingdom Villas has lots of amazing artwork dotted around which is great to walk around and look at. It’s almost like being at a museum! Venture outside, and you can view the animals on the savanna – in the evening too with the use of night vision goggles! There is a roaring fire, and rocking chairs dotted around the deck and I do wish we had explored the resort a lot more than we did. We didn’t even see the pool area, let alone go in it. And we didn’t dine here either.